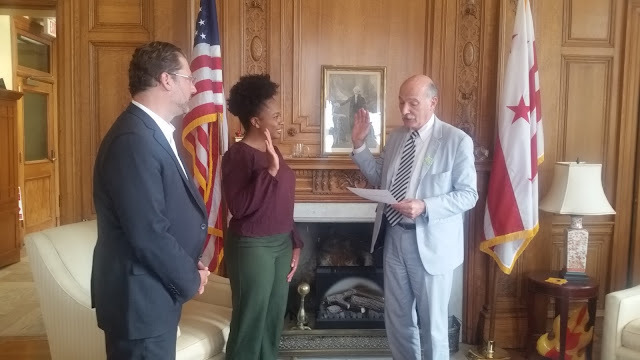 The BAC welcomed new member Sade Adeeyo, representing Councilmember David Grosso. Council chair Phil Mendelson administered the oath of office on Aug. 10. The Facilities Committee held a "rolling" meeting on Aug. 5 to survey the Alabama Avenue SE Corridor and advise about bicycle infrastructure within the study area. Left to right: BAC member Susan Balding, DDOT bike planner Darren Buck, Facilities Committee co-chair Jeanie Osburn and BAC chair David Cranor discuss bike infrastructure along the Alabama Avenue SE Corridor. The BAC holds its bimonthly meeting on Sept. 6 at 6 p.m. at 441 4th St NW, 11th floor. Here is the agenda. Meetings are open to the public. The BAC is recruiting a new Legislative Committee chair. This position is open to any D.C. bicyclist, not solely appointed BAC members. Please attend the meeting or email the BAC to express interest in leading the committee, which meets in even-numbered months on a day of the chair's choosing. DDOT online open house to comment on designs for the 16th Street NW dedicated bus lanes, which would permit bicycle traffic in the lane. The public comment period is open through Sept. 8. 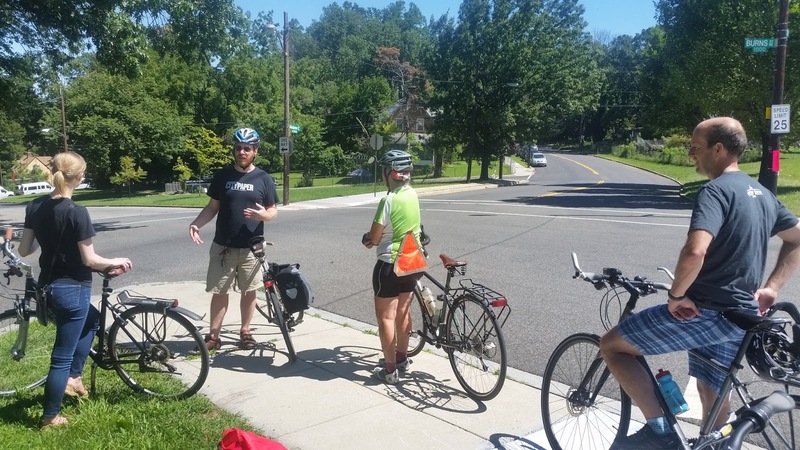 The DDOT calendar posts additional meetings concerning bicycle infrastructure.